ASHEVILLE, N.C. – A North Carolina company, J & J Snack Foods Handhelds Corp., has recalled nearly 60,000 pounds of frozen, stuffed-sandwich products. An April 5 report from the United States Department of Agriculture's Food Safety and Inspection Service said the sandwiches may be contaminated with semi-transparent plastic. The items were shipped to retail locations nationwide. The manufacturer discovered the problem after consumer complaints, though there have been no reports of injury or illness. 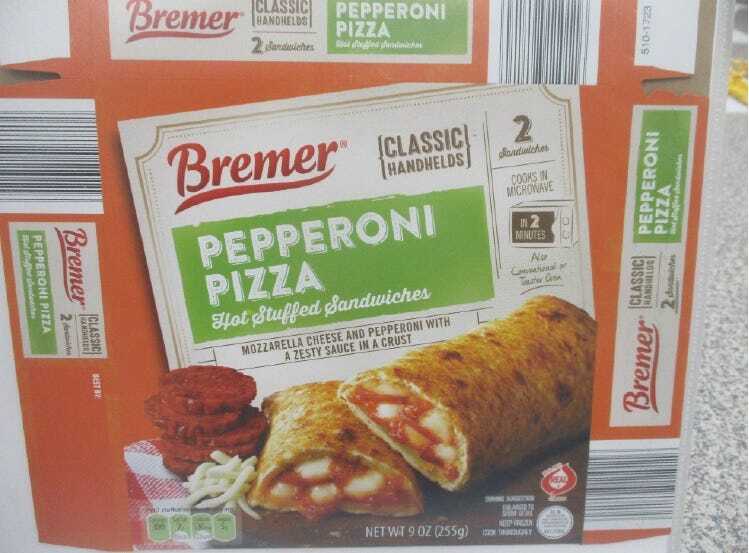 Nine-ounce carton packages containing two stuffed pepperoni sandwiches with “Bremer Classic Pepperoni Pizza Hot Stuffed Sandwiches,” and best if used by dates of “Aug. 12 2020” or “Aug. 13 2020,” on the label. Nine-ounce carton packages containing two ham and cheese sandwiches with “Bremer Classic Ham and Cheese Hot Stuffed Sandwiches” and best if used by dates of “Aug. 12 2020,” or “Aug. 13 2020,” on the label. I stupidly left on a low table. It was wrapped in plastic cling film. He suffered no ill effects, and I bagged the poop with the plastic in it the next day. However, I went without lunch, for which I said to him, "Bad dog!" He looked suitable sheepish, so I patted him on the head. He wagged his tail and all was forgiven. I suspect that people can pass small bits of plastic, undigested, as well. I'd rather not, but, I'm sure I've ingested some plastic now and then during my long life. I'm curious to know exactly what form of plastic went into these Hot Pockets knockoffs. Shards of sharp plastic from a part of a machine used to cut the product or its components during the manufacturing process would be another thing entirely.